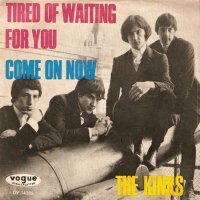 (1964) "Tired of Waiting for You"
(1965) "Ev'rybody's Gonna Be Happy"
"Tired of Waiting for You" was a hit 1965 rock song by the English band The Kinks. The song was released as a single on 15 January 1965 in the UK and on 17 February 1965 in the USA. It then appeared on their second studio album Kinda Kinks. According to Ray Davies, the music for "Tired of Waiting for You" was written on the train to the recording studio and the words were written at a coffee shop during a break in the session. The recording went well but there was something missing and it was my raunchy guitar sound. Ray and I were worried that putting that heavy-sounding guitar on top of a ponderous song might ruin it. Luckily it enhanced the recording, giving it a more cutting, emotional edge. In my opinion 'Tired Of Waiting' was the perfect Pop record. Davies also said of the song, "It was a change of style for us, we got a bit posher! Our material started to get a bit more melodic after that." The song was recorded late August 1964 at Pye Studios (No. 2), London, with additional guitar overdub at IBC Studios, London on 29 December 1964. "Come On Now" was recorded 22 or 23 December 1964 at Pye Studios (No. 2). "Tired of Waiting for You" was written before "All Day and All of the Night," but "All Day and All of the Night" was released first due to its similarities to the band's first UK hit, "You Really Got Me." It reached No. 1 on both the UK Singles Chart and Melody Maker, becoming the band's second UK chart-topper since "You Really Got Me." The single also reached No. 6 on the US Billboard Hot 100, the highest charting Kinks single in the US until the band's 1983 hit "Come Dancing" tied it. According to Ray Davies, the band received a telegram from London in New York telling them of the success on Melody Maker, but while the rest of the band went partying, the elder Davies brother ordered a bottle of champagne and enjoyed his success. The song was played in the background at a roller skating rink during episode five of the first season of True Detective. "Tired of Waiting for You" was covered by The Flock on their 1969 release "The Flock". "Tired of Waiting for You" was also covered by Green Day as a B-Side to the single "Basket Case", and would later have an official release on their 2002 album Shenanigans. Five years earlier, in 1997, the song appeared on the soundtrack to Howard Stern's biographical film Private Parts. Nancy Sinatra, include this on her 1998 album, Sheet Music. British rock band Little Angels included a cover entitled “Tired of Waiting For You (So Tired)” on their 1993 album, “Jam”. ^ a b c d Rice, Jo (1982). The Guinness Book of 500 Number One Hits (1st ed.). Enfield, Middlesex: Guinness Superlatives Ltd. pp. 87–9. ISBN 0-85112-250-7. ^ a b "Tired of Waiting for You". Songfacts. ^ Hickey, Andrew. Preservation: The Kinks' Music 1964-1974. ^ a b "Chart Stats - The Kinks - Tired Of Waiting For You". Chartstats.com. Retrieved 28 December 2009. ^ Hinman, Doug. The Kinks: All Day and All of the Night. ^ "Nederlandse Top 40 - week 11, 1965". Top40.nl (in Dutch). Retrieved 28 December 2009. ^ "German Singles Chart". Offiziellecharts.de. GfK Entertainment. Retrieved 1 January 2018. ^ "Irish charts : search results". Irishcharts.ie. Retrieved 28 December 2009. ^ "HBO: True Detective: S 1 EP 05: Music". HBO. Retrieved 3 November 2015. This page was last edited on 11 March 2019, at 18:55 (UTC).